Sometimes, you don't know about something until you stumble onto it. I was walking around Disneyland this past Sunday and passing by the courtyard next to the Pieces of Eight gift shop when a delightful sight caught my eye. It was an elaborate Halloween decoration (so I assumed) that looked surprisingly out of place, given that Christmas had already swarmed all over the park. But upon closer inspection it was a scene from A Nightmare Before Christmas, and a most charming backdrop too! I'm not sure how long it has been here--perhaps since Halloween Time--but I found it positively wonderful. What a nice surprise to find in a courtyard that's normally just a passage! This Photo Pass location at 21 Royal Street is adorable. 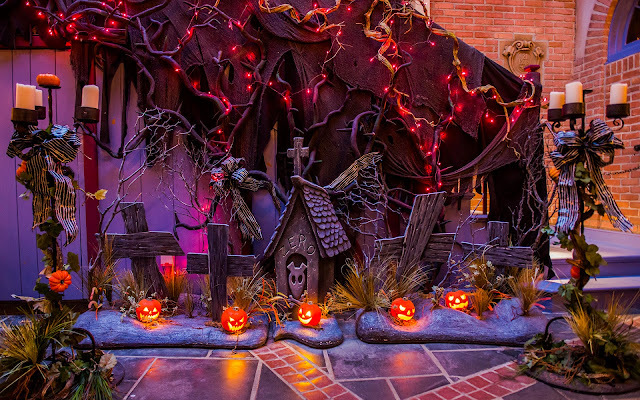 This is the photo location for meeting Jack Skellington and Sally during the day time. The decorations are up starting with Halloween Time and end once Christmas Time has concluded at the resort. I assumed as much. The backdrop is lovely!